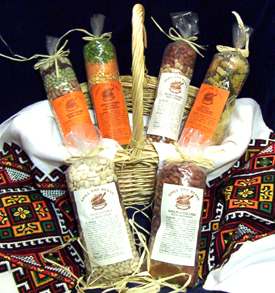 Spill the Beans healthy and hearty soup and salad mixes are now available. Check our full line of soups, salads, soy bean snacks and chilies. Check out our nutrition page for all the info you need regarding the importance of including beans in your daily diet. We do so enjoy your feedback so please drop us an e-mail, we’d like to hear how you’ve enjoyed our product. Any alternative preparation suggestions are greatly appreciated. Beans have become the trendiest food in restaurants lately. They are also very popular in vegetarian cooking because they're very versatile. Due to this versatility, beans are becoming "chic"!! copyright © 2004 Spill the Beans. All rights reserved. Site design and developed by Tom Kubow.